I tried making chocolate sugar cookies for the first time several years ago, just to have something to change up the traditional sugar cookies I make for decorating. They tasted great right out of the oven -- like little brownies -- but they hardened quickly and didn't taste very chocolatey. I've tested a few other recipes since then and had similar results. If they tasted great, they spread while baking. If they didn't spread, they didn't taste that great. And then I found this recipe. And I made many, many cookies, as evidenced by the small collection below. I wanted to try a non-traditional color palette for these cookies -- something that would really pop against the deep chocolate color of the cookies (another major plus of this recipe). I decorated the cookies above using my FAVORITE ROYAL ICING recipe and four AmeriColor Soft Gel Paste colors -- Bright White, Royal Blue, Sky Blue, and (a very soft) Teal. I love the accent of the dark blue against the other shades -- it's almost like a Delft blue -- very rich and unexpected for holiday cookies. To get the fine detail, I used an Ateco #2 tip for the flooding and a #1.5 for the lines and dots. 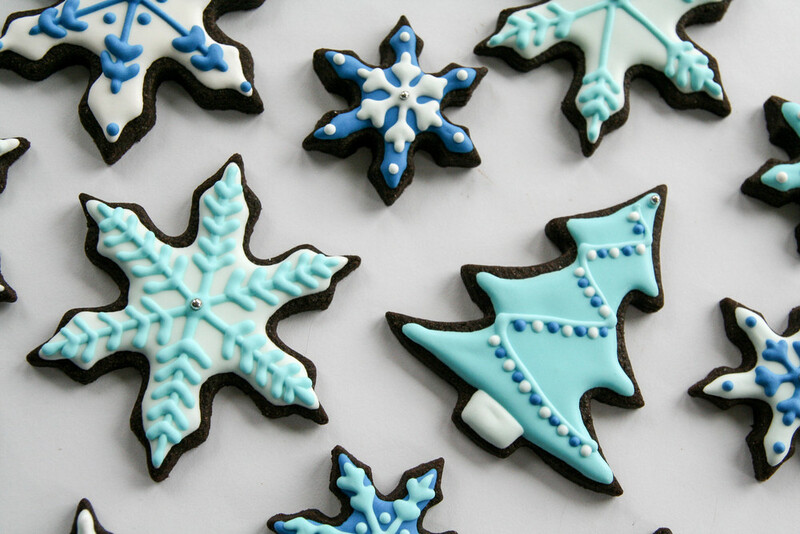 There were so fun to make -- they are a deep chocolate flavor that holds it's shape while baking (see the snowflakes? You can't get much better than that) and makes for a striking backdrop for lighter shades of icing.